Haven’t we always seen many madisaar mami’s in our tamil film songs? Haven’t they all always left an impact on the audience? Is it the costume? Is the the way the song is picturised? Or is it the way the song and these madisar maami’s that make us dance? Time to find out! Well rewinding a few decades, Vietnam Veedu movie released in the year 1970. The song ‘Palaghatu pakathile’ made a huge hit. Sung by TM.Sounderarajan and Susheela , the Sivaji – Padmini combo was admired in the traditional veshti- madisar look. A song which released before this was ‘Aduthhathu ambujatha’, from the movie Ethirneechal which released in the year 1968. We see Sowcar Janaki totally doing justice to a ‘brahmin’ look. Moreover the lyrics of the song add to the ambience that we exoect out of this song. Moving ahead, our Thalaivar has also contributed to this look. Wondering which song? Have you seen the song ‘Maadathile kanni’ from the movie Veera? A brilliant composition by Raja Sir, with Swarnalatha and S.P.B singing the leads, we see Rajini and Meena looking traditional in the attire. Talking about Rajini, how can we forget the Ulaganayagan Kamal Haasan? Kamal Haasan and Urvashi in ‘Sundari Neeyum’ strikes our mind immediately. 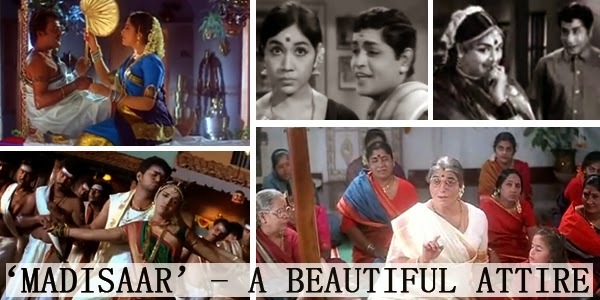 A classic hit from the movie Michaelmadhana kamarajan, we see Urvashi dressed in ‘Madiar’ throughout the song. What is also worth remembering at this point is that we saw Kamal Hassan in a ‘Madisar’ in the movie Avvai Shanmugi. Well the song – ‘Rukku Rukku Are baba rukku’ springs up in our heads now, doesn’t it? A song with the name of the attire itself is here!! – Well the song is ofcourse ‘ Madisaar katindu vandhaale maharani’ from Villadhi Villan starring Sathyaraj and Radhika which hit the screens in 1995. Tune in to our ‘MadisaarMaami’ songs here.